I am serving as a missionary with Walking Together for Christ and “tentmaker” implementing OpenMRS in Haiti. My real ministry is media ministry; producing, translating and showing evangelistic films, like the Jesus Film, God's Story, The Hope, Le Combat, La Solution, True Security, True Forgiveness, Incomparable Grace and Magdalena. The group arrived safely and are resting. Several had no or little sleep last night so they got them fed and rested up for their journey tomorrow. They are in good spirits and will be a blessing! The bus leaves at 9:00 AM from Caribe Tours in Santo Domingo. We expect the team to arrive in Port-au-Prince by 2:00 PM. I am a partially self-supported missionary/tentmaker living and working with "Walking Together for Christ" in Haiti. I financially supplement media ministry evangelism by working for NGO's implementing OpenMRS. Visit my Photo Galleries. The following Christian evangelistic movies in Haitian Creole are available from me. Contact me for details, or purchase online. 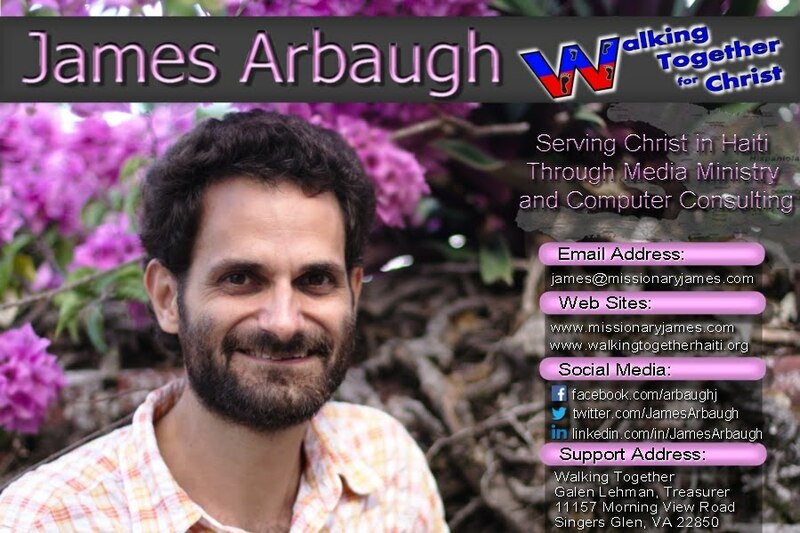 James arrived to Port-au-Prince safely. James is now in Port-au-Prince, Haiti.